IE Business School was named the Most Influential Brand on LinkedIn for the 2nd year in a row! IE Business School has been recognized as the most influential brand in Spain in the 2017 Prizes awarded by the Spanish arm of LinkedIn, the world’s largest professional network with 500 million users, 10 million of them in Spain. IE Business School received the prize for the Most Influential Brand for the second consecutive year, having competed in the finals against Telefónica and Santander. 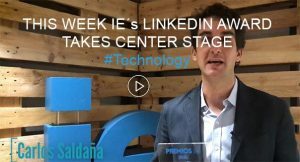 The LinkedIn prizes are awarded based on LinkedIn’s Content Marketing Score, which is calculated by measuring the level of interaction of a brand among its audience. The LinkedIn team then evaluates data extracted from the Content Marketing Score to pinpoint the actions that promote interaction with site content. Santiago Iñiguez de Onzoño, Executive President of IE University, is very active in this regard, being one of 500 LinkedIn Global Influencers, and the only influencer in Spain. “We have received this Prize thanks to the efforts of the entire IE community – students, alumni, staff and other stakeholders, as well as to IE’s commitment to quality and innovative content,” says Carlos Saldaña, director of marketing at IE. 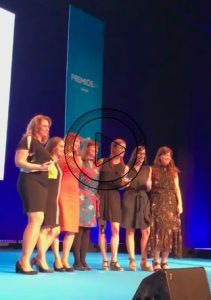 The LinkedIn Insights team selected finalists for this edition of the Prizes by examining the impact of over 1,000 Spanish firms that use LinkedIn Talent Solutions, LinkedIn Learning and LinkedIn Marketing Solutions. After analyzing their profiles, the team chose a total of 27 business organizations and 8 business leaders to be the finalists in 11 categories: Top Social Executive, Top Recruiter, Top Selection Team, Top Employer Brand, Upcoming Business Organization, Top Foreign Multinational, Brand with the Biggest Growth in Influence in Spain on LinkedIn, Most Influential Brand in Spain on LinkedIn, and Best Culture of Learning.